The weather has been getting nice here in Holland. Spring has finally arrived and that makes me think about summery treats like ice cream. 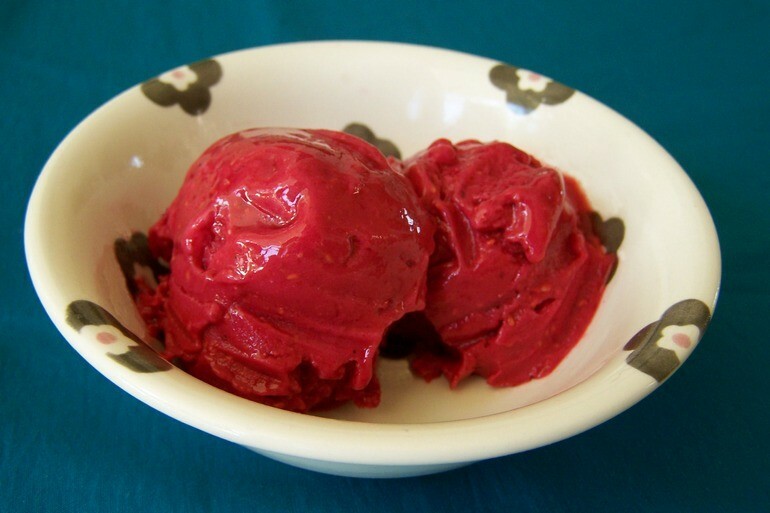 If you have a high powered blender or strong food processor it's super easy and quick to make your own fruity soft serve, sorbet, ice cream or whatever you like to call it. Choose berries as your fruit to keep this really low in carbs. The ice cream in the picture is made with nothing more than frozen raspberries, soy milk and a little bit of concentrated sweetener. In my Vitamix blender it is ready in less than a minute! You can also make this in a food processor, but it will probably take longer and the end result may be a little softer. If your blender is a bit wimpy you could also just puree fresh fruit and poor it into a mold and freeze it to make healthy popsicles. You're not limited to fruit flavors either. At the bottom I have a recipe for a deliciously creamy low carb ice coffee. You could also add cocoa powder to your creations to make chocolate ice cream or add mix ins like nuts and chocolate chips for a special treat. This is the lovely ice cream in the picture. Add all the ingredients to the jar of your high powered blender or food processor and blend at the highest setting until. Use your blender's tamper or a spatula to push the fruit down the sides of the jar. Stop as soon as the fruit has been transformed into a smooth mass. Divide the ice cream over two bowls and serve. The vegan yogurt gives this ice cream a lovely fresh flavor. This is a nice one for the fall, when berries are not in season. The nut butter makes this ice cream extra creamy, but you can leave it out and add a little more milk. This is a low carb homemade version of the beloved 'Frappuccino'. Mix the 1/2 cups of water and milk with the instant coffee until the coffee dissolves. Poort he mixture into an ice cube tray and freeze it overnight. Add the coffee ice cubes into the jar of your blender along with the other ingredients and blend on high until it forms a slush. Divide the coffee over two tall glasses and serve.